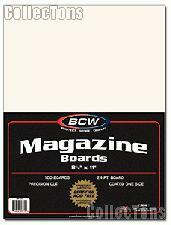 We are pleased to offer for sale these Magazine Backing Boards by BCW! 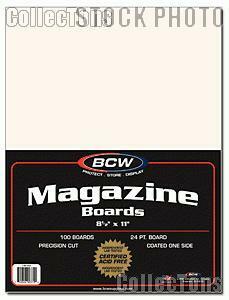 The BCW Magazine Backer Boards are made from a full 24 point solid bleached sulfate, coated on one side and buffered with 3% calcium carbonate, and are precision cut to size. Use this item along with BCW Magazine Bags to protect and store your collectible magazines. Size 8 1/2 x 11. 100 boards per bag, this item is new from our inventory.